Here are some snazzy birthday facts about 16th of November 1964 that no one tells you about. Don’t wait a minute longer and jump in using the content links below. Average read time of 11 minutes. Enjoy! What day was my birthday Nov 16, 1964? November 16, 1964 was a Monday and it was the 321st day of the year 1964. It was the 46th Monday of that year. The next time you can reuse your old 1964 calendar will be in 2020. Both calendars will be exactly the same! This is assuming you are not interested in the dates for Easter and other irregular holidays that are based on a lunisolar calendar. There are 211 days left before your next birthday. You will be 55 years old when that day comes. There have been 19,877 days from the day you were born up to today. If you’ve been sleeping 8 hours daily since birth, then you have slept a total of 6,626 days or 18.14 years. You spent 33% of your life sleeping. Since night and day always follow each other, there were precisely 673 full moons after you were born up to this day. How many of them did you see? The next full moon that you can see will be on April 19 at 11:14:00 GMT – Friday. Fun stat: Your first one billion seconds (1,000,000,000) happened sometime on July 25, 1996. If a dog named Conner - a Irish Red and White Setter breed, was born on the same date as you then it will be 263 dog years old today. A dog’s first human year is equal to 15 dog years. Dogs age differently depending on breed and size. When you reach the age of 6 Conner will be 42 dog years old. From that point forward a medium-sized dog like Conner will age 4.5 dog years for every human year. Thirty Years’ War: Battle of Lützen is fought, the Swedes are victorious but King Gustavus Adolphus of Sweden dies in the battle. Cunard Line’s RMS Mauretania, sister ship of RMS Lusitania, sets sail on her maiden voyage from Liverpool, England, to New York City. What does my birthday November 16, 1964 mean? 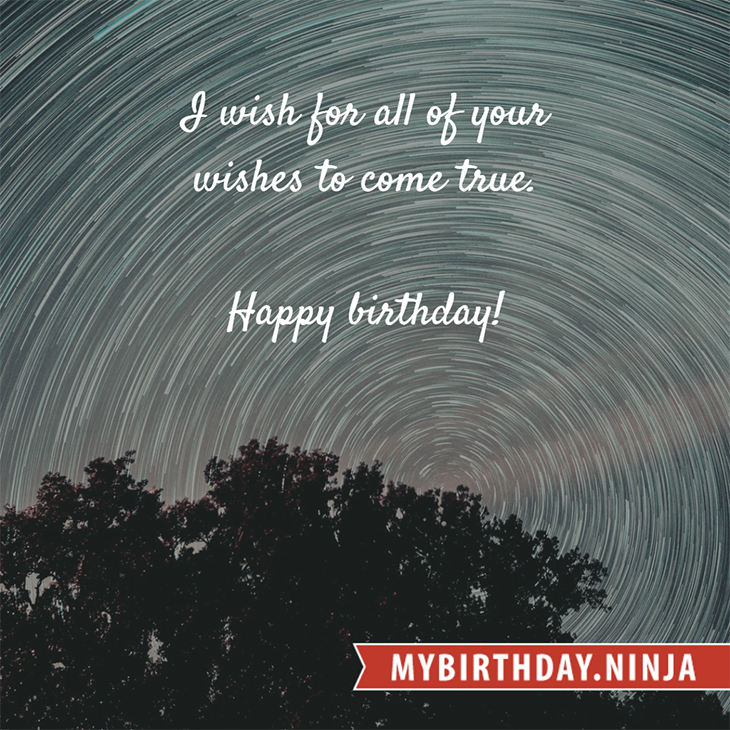 Your birthday numbers 11, 16, and 1964 reveal that your Life Path number is 2. It represents balance, harmony and partnership. You have the soul of an artist. You are a fine companion and possess a good sense of humor. Friends seek you out for your calming and peaceful company. The following celebrities also have the same life path number: Anett Griffel, Jane Froman, Samantha Hammel, Don Hahn, Clifton James, Lisa Loeb, Roger Taylor, Sandi Thom, Ian MacKaye, Jessi Colter. 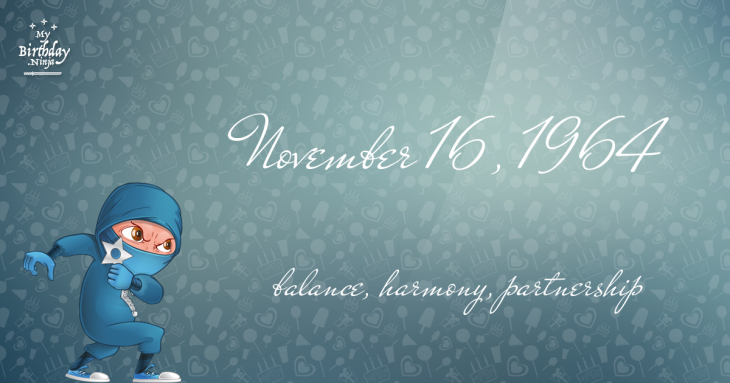 What is the birthday horoscope for Nov 16, 1964? The Western zodiac or sun sign of a person born on November 16 is Scorpio ♏ (The Scorpion) – a fixed sign with Water as Western element. The ruling planet is Pluto – the planet of transformation. According to the ancient art of Chinese astrology (or Eastern zodiac), Dragon is the mythical animal and Wood is the Eastern element of a person born on November 16, 1964. Fun fact: The birth flower for 16th November 1964 is Chrysanthemum for loveliness. What is the Love Match for Nov 16, 1964? When it comes to love and relationship, you are most compatible with a person born on June 18, 1991. You have a Love Match compatibility score of +152. Imagine being in love with your soul mate. On the negative side, you are most incompatible with a person born on August 20, 1971. Your incompatibility score is -163. You’ll be like a cat and a dog on a love-hate relationship. Arf-arf, I want to bite you. Meow-meow, stay away from me! The number-one hit song in the U.S. at the day of your birth was Baby Love by The Supremes as compiled by Billboard Hot 100 (November 21, 1964). Ask your parents if they know this popular song. I do not know how you feel about this, but you were a female ♀ in your last earthly incarnation. You were born somewhere around the territory of Central India approximately on 1725. Your profession was leader, major, captain. How many babies were born on November 16, 1964? Base on the data published by the United Nations Population Division, an estimated 115,215,976 babies were born throughout the world in the year 1964. The estimated number of babies born on 16th November 1964 is 314,798. That’s equivalent to 219 babies every minute. Try to imagine if all of them are crying at the same time. What is the popular baby name on 16 Nov 1964? Here’s a quick list of all the fun birthday facts about November 16, 1964. Celebrities, famous birthdays, historical events, and past life were excluded. Try another birth date of someone you know or try the birthday of these celebrities: April 25, 1945 – Stu Cook, American bass player, songwriter, and producer (Creedence Clearwater Revival and Southern Pacific); March 19, 1959 – Terry Hall, English singer-songwriter (The Specials, Fun Boy Three, The Colourfield, and Vegas); May 29, 1961 – Melissa Etheridge, American singer-songwriter, guitarist, and activist.